Ryan Garton (Pitcher), Ian Miller (Center fielder), Orlando Calixte (Shortstop), Tyler Danish (Pitcher), Robin Leyer (Pitcher), Jose Lobaton (Catcher), Tim Lopes (2nd baseman), Tommy Milone (Pitcher), Austin Nola (Catcher), Tayler Scott (Pitcher), Joey Curletta (1st baseman), J.P. Crawford (Shortstop), Braden Bishop (Center fielder), Matt Festa (Pitcher), Christian Bergman (Pitcher). I sent a LOR, SASE, and a TC to Mr. Pat Listach c/o Tacoma Rainiers 2502 S Tyler Street Tacoma, WA 98405 Sent : 3/3/26 Received : 3/24/16 http://surfmypictures.com/image/294245b ... 3y54y.html Pat Listach is the manager for the AAA affiliate of the Seattle Mariners, the Tacoma Rainiers. When I sent this request out, I knew MLB spring training was underway. 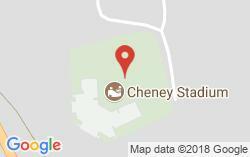 I assumed that my request would sit there and be waiting for Mr. Listach after spring training was done and Mr. Listach would go to the Rainiers stadium, Cheney Stadium. Well, from the picture, it looks like my request was redirected from Cheney Stadium address to the Mariners' spring training stadium. Nevertheless, it took only 3 weeks turnaround.